Also: Bulls, Blackhawks ratings continue to drop; don’t expect an announcement on a new Cubs network anytime soon. 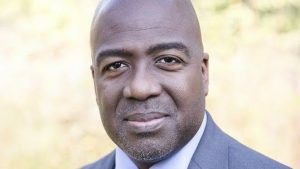 NBC Sports Chicago announced Thursday it has hired Kevin Cross as senior vice president and general manager of the regional sports network (RSN). He take a position once filled by Phil Bedella, who left in May 2017. He’ll report to NBC Sports Regional Networks President Bill Bridgen. A South Side native, Cross has worked in the business for more than 25 years. He began his producing career at the old SportsChannel Chicago in 1993 and worked trough various iterations of the channel, including Fox Sports Net Chicago and Comcast SportsNet. He has also had stops at Timeline Products and CLTV. Cross is set to take over day-to-day operations of the RSN at a time when the network is about to undergo a significant change when the Cubs depart the NBC Sports Chicago partnership in October to launch their own channel (see below) and is continuing with existing partners Chicago Bulls, Chicago White Sox, and Chicago Blackhawks. And judging by the ratings for all three – and the exit of the popular Cubs – not to mention the struggles RSNs like NBC Sports Chicago are facing, the price-per-subscriber point is expected to drop significantly. And speaking of those ratings for the Bulls and Blackhawks, the numbers for NBC Sports Chicago couldn’t have come at a worse time. According to the Sun-Times, ratings so far this season for both teams are down again as they continue to struggle on the hardwood and the ice, respectively. Bulls games so far has averaged a 1.4 household rating on the RSN, down 22 percent from last season’s 1.8 average. The Blackhawks have averaged slightly better with a 2.1 household rating, which is actually decent for hockey, a sport who historically hasn’t drawn well. However, the team is down 13 percent from the 2.4 season average in 2017-18. The ratings declines come as no surprise: both teams are at or near the bottom of respective leagues in the standings and there is a possibly Chicago could become the first city to have the number one draft pick in both sports simultaneously. As of this writing, the Blackhawks have lost five in a row and have the worst record in the NHL; the Bulls have dropped nine straight and have the second-worst record in the NBA. Makes you miss the Bears, doesn’t it? And don’t forget the Hawks’ season average ratings are still higher than they were in the 2007-08 season, before they won they won three Stanley Cups and were still a doormat franchise. If the Blackhawks continue to put up performances on national TV like they did Thursday night – a loss against the Rangers aired on NBCSN – their appeal could easily diminish. Meanwhile, the NBA is probably glad the Bulls aren’t on national TV much – ratings are down for partners Turner and ESPN thanks to LeBron James’ move to the Los Angeles Lakers in the off-season – magnified more thanks to James’ injury in a Christmas Day game against the defending champion Golden State Warriors and has been sidelined ever since. As opposed to playing with the Cleveland Cavaliers and Miami Heat, James’ plays for a team whose games start late for those in the Eastern Time Zone – another factor in the drop. And as for the Cubs, don’t look for the team to announce details regarding their new RSN anytime soon. 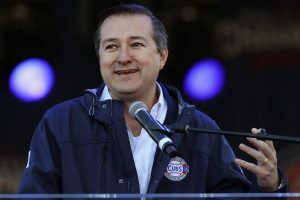 During an appearance on WSCR-AM Thursday morning, Cubs chairman Tom Ricketts stated they would have no announcement on the new network, as a Q-and-A session with the owners at the upcoming Cubs Convention has dropped due to “low ratings” (their words, not mine.) Ricketts stated the same in an interview with WMVP-AM later in the morning. “People would rather watch the mascot play bingo than listen to the owners speak”, Ricketts said on WSCR. Other topics Ricketts covered in his Thursday morning media barnstorming junket included talking about off-season moves (or lack thereof) and criticizing the alderman of the ward Wrigley Field is in. Ricketts made stops at WSCR and WMVP Thursday with the convention coming up this weekend at the Sheraton downtown, assuming fans can get there with a major snowstorm coming. While the Cubs Convention would be an ideal place to unveil the new RSN, uncertainty surrounding the Fox RSNs may have played a role in a decision to hold off on an official announcement. This may be because Sinclair Broadcast Group – reportedly a partner with the Cubs in their new RSN venture – is in discussion to buy the 22 Fox RSNs from Disney – but would need backing from private equity firms to pull it off. As noted here earlier, Disney had hoped to sell the RSNs, but had a difficult time unloading them because potential suitors – notably Comcast and AT&T, are scared off due to anti-trust concerns from the Justice Department – the same reason Disney had to unload them in the first place. Rumors of the reported partnership with Sinclair in a Sun-Times article a few weeks ago sparked some social media criticism as the company is known for right-wing propaganda in its local newscasts and for forcing anchors to read a script on fake news last year, word-for-word on almost all of its TV stations. The mess may not be resolved for awhile. Thus, the Cubs are being smart in holding off on an announcement – hopefully not too long as the new network is scheduled to launch in 2020. And if the Cubs are looking for time to fill on their new network, a bingo game show with Clark The Mascot wouldn’t be a bad idea – it sure beats watching the inane Ellen’s Game Of Games.